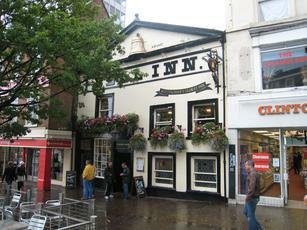 The Bell is in the central shopping area and is another Greene King pub. There are a number of bars. We first tried one in a room in the right as we walked in. But there were no staff in there and the reaction from drinkers in the room was that there was unlikely to be for some time. We tried another room across the central corridor. There were staff present, but a limited ale selection. Persevere and continue to the largest room at the rear. There were multiple bar staff and the full range of ales - Greene King Bell Inn Bitter, IPA & Abbot, Morland Old Speckled Hen, Nottingham Extra Pale & Robin Hood, Shipstones Original, Grafton Caramel Stout, Magpie Cherry Raven & Oakham Green Devil. The World Cup match between France and Argentina was just reaching half time. We were rather amused by the guy dressed as a cowboy with a cucumber in his holster at the bar. A nice old pub, that was busy on our visit. But there is plenty of space for the throngs. A fine, historic pub. It must be 10+ years since I last visited. A great place with numerous rooms and efficient, friendly service at the bar. I enjoyed a pint of the local Nottingham Brewery Extra Pale Ale which was in fine form. At £3.20 a pint it was not a bad price for city centre these days. Well worth a visit. 8/10. Enjoyed a couple of pints of Guinness and a nice steak on our way to a concert. Really enjoyed both and the staff were very helpful and efficient. Will call in again next time we're in the area. Multiple bars and a tardis like interior. A pint of Bell for me. Sat in the window and watch the variety and madness of a wednesday night student fancy dress parade. My god, what a sight.